With two Siberian Huskies, it gets pretty hairy around here! I have to vacuum at least every couple of days or we're all knee deep in it. Well, maybe not knee deep, but everyone that comes in our home will leave furry. Just before we left for our Oregon trip, my vacuum stopped working. It had already been a couple of days since I last ran the vacuum. Uh-oh. I bought the kind of vacuum that doesn't require bags. Bagless. And my particular model is the Pet Hair Eraser. SOLD. How could this not be the right one for me? Well, I'm not in love with it. I haven't gotten all the little attachments situated just so and they seem like they could pop off pretty easily. And it's a little difficult to push, but maybe that is just a height adjustment situation. I might fall in love eventually, but I'm easing into this slowly. But what I do love is emptying out the appropriately named "Easy Empty Dirt Container". Not to gross anyone out but LOOK!!! Ewwwww. This was picked up from vacuuming 4 large area rugs. Can you believe it? Just in case you didn't see it in the first shot, I got in a little closer here. EWWWWWW. Ah, domestic thrills in my life. I just had to share this, so thank you so much for listening. And looking! And now, I can invite you over without the risk of you leaving my house furry. How could someone this cute cause so much dirt? 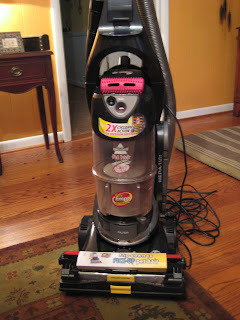 Kerri, I love to hear about vacuum cleaners! I am on a quest for the best vacuum cleaner! We have 3 cats and I totally get the fur thing. Our vacuum cleaner had a "Pet Paw" attachment, but then the suction just didn't work that well. The only thing I've found that does is a Shopvac (super suction) combined with masking tape. But oh, what a pain! Keep us posted on this one! XO! no, soraya, they really AREN'T any trouble at all. they are just the sweetest girls i've ever known and i'm really not complaining...more than happy to sweep up their hair! very small price for all the joy they bring me!! No one ever died of a little dog hair, lol. I use a Rainbow around the office, sucking up the little tumbleweeds that collect in the corners. And it is cool to dump it out and see what it collected. Thanks for your note, btw. LOL! I have one very similar and I am amazed how much dog hair it picks up (and how much our one dog can shed!). Your sweet girl is beautiful! Isn't amazing how they can leave so much hair about in one day? We have a dog and two cats and oh my! the new animals that seem to emerge from the fur left behind by the 3 current residents! I hate hate hate vacuuming...yuk. I need a vaccum fairy to come and go as needed. I love your dogs , so cute. Beautiful dogs, is that one blue eye and one not I see. I checked out your music, its great. "Too good to be" is my favourite.